Tooth extraction (pulling teeth) is a surgical procedure where we remove a tooth from the socket in your jawbone under anaesthetic. Infection – a badly damaged or decayed tooth may become seriously infected, right down to the pulp, causing toothache and inflammation and cannot be saved by root canal work or antibiotics. When this happens, extracting the tooth may be the best option. Periodontal disease – similar to a tooth infection, if your gums have become severely diseased, the bacteria that built up on the teeth travels through the gums down to the bone that holds your tooth in place. Once this happens, the tooth loosens and must be removed. Chipped or broken – if you have badly damaged your tooth through trauma and have been left with a bad chip or crack, your tooth may not be salvageable, and it may be best to pull it out. Overcrowding – too many teeth in your mouth make it difficult to maintain good oral hygiene (brushing and flossing) and often, those suffering overcrowding will have one or more teeth removed before beginning the process of realigning the teeth with braces (through orthodontic work) or clear aligners such as Invisalign. Wisdom tooth problems – often, wisdom teeth must be removed as there isn’t enough space for them to break through the gums. They may become impacted (stuck behind the tooth in front) which can become dangerous, deeming it necessary to remove the wisdom tooth or teeth. Occasionally, patients have one or more teeth removed due to financial reasons. Ideally, we prefer you to keep your teeth by carrying out the necessary dental work to salvage them. However, sometimes the amount of dental work required is too expensive for the patient. If so, the best option is extraction. In these cases, the dentist will thoroughly discuss the pros and cons with the patient so that they can make an informed – and not rushed – decision. In a typical extraction, you’ll first be given plenty of local anaesthetic to numb the area. If you are anxious, your dentist will happily give you some medication to put you at ease before starting the procedure. Once the dentist is certain you are thoroughly numbed up, the dentist will hold the tooth with forceps and gently move it back and forth until it is released from the jawbone. If your tooth is impacted or is too difficult to remove, your dentist may have to remove it in sections. After your procedure, you’ll be sent home with appropriate medications and told to rest. Full recovery will usually take anywhere approximately two weeks. In this time, your gum tissue will gradually heal, and our dentist will remove your stitches. By the end of the two weeks, your gum should have completely healed. In about 2% of cases, about 3 to 4 days after tooth extraction, a blood clot may dislodge from the wound, leaving the unhealed socket (including the underlying bone and nerves) exposed. This is called a dry socket (alveolar osteitis) and can be quite painful. The patient will experience throbbing pain, bad breath and a foul taste in their mouth – all signs that healing has been interrupted. You can help to avoid a dry socket by keeping the area clean. For example: avoiding a bacterial infection; not smoking – nicotine decreases the blood supply in the mouth and inhibiting healing; being gentle with your mouth – and not spitting, rinsing or sucking; and being in good health at the time of your procedure. Tooth extraction is a dental procedure, usually performed in the chair by your dentist, where your natural tooth is removed from the jaw bone. Will tooth extraction cure periodontal disease? Tooth extraction is usually the end stage for your tooth if you have periodontal disease, but more action is likely to be required. Depending on the severity of your gum disease, you may need scaling and root planning or periodontal surgery. How long does it take to have a tooth pulled out? The actual extraction process does not take long. If it is a simple extraction (meaning that the particular tooth had already erupted in the mouth) it will usually only take 15 minutes. Usually, your dentist will ask you to take two to three days afterwards to relax and allow the treated area to clot and heal. Is it painful to get a tooth extracted? No, not as much as you would think. At the time of the extraction, we will give you adequate medication so that you feel completely numb and not feel the extraction. Afterwards, only the socket will be left. Your socket is likely to be tender; however, your dentist will give you pain medication if they think it necessary. In about 2% of cases, a few days after the procedure, some clients may experience a dry socket which is where a blood clot dislodges from the wound. Dry sockets are particularly painful. If you experience a dry socket, contact the dental clinic immediately. 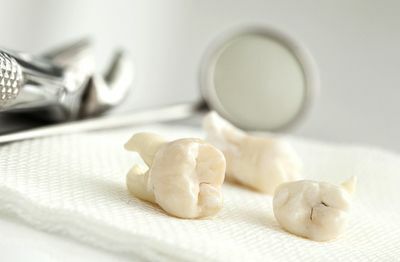 To help avoid a dry socket, keep the area as clean as possible and adhere to your dentist’s post-surgical instructions. Will I be put to sleep before tooth extraction? Most people only require local anaesthesia for tooth extraction. However, if you are particularly nervous about your procedure – or any dental procedure – we have sedation options available. Speak to your dentist for more information. Oxford Street Dental provides tooth extraction to patients in the Leederville area and surrounding suburbs of West Leederville, North Perth, Wembley, Mount Hawthorn, West Perth, Northbridge, Glendalough, Jolimont, Highgate, Mount Lawley, Daglish, Osborne Park, Yokine, Menora and Joondana. Contact us today to book your tooth extraction appointment at our practice conveniently located right in the heart of Leederville.